Hey look, the Teutels are in the news again! It's not another kick in the junk for Paul Sr., though. 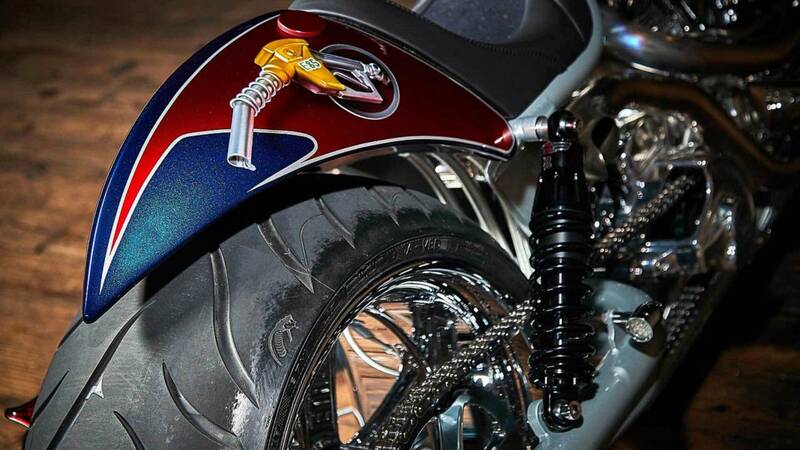 This time we bring you a story about yet another interchangeable American Chopper bike built by Paul Jr., but one with a special twist. It runs on corn juice. According to AgWired, a publication dedicated to news from the world of agribusiness, the bike was built for the Renewable Fuels Association as a way to promote the use of E85. 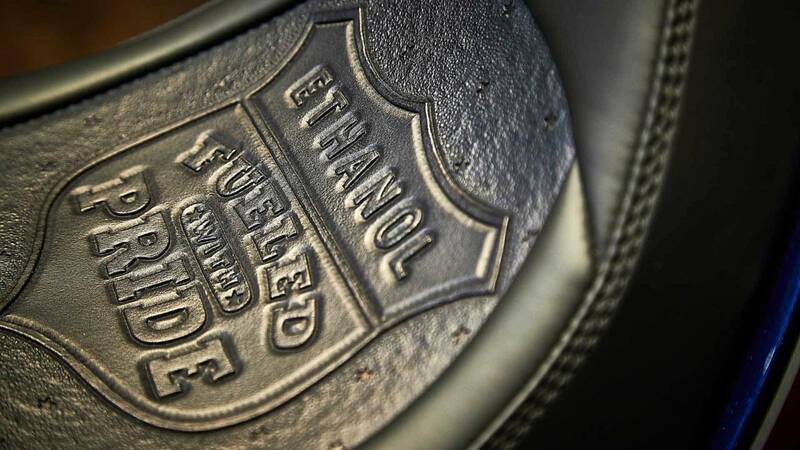 The RFA, if you don't know, is a group that represents the ethanol industry by promoting policies, regulations, research, and development to increase the production and use of ethanol fuels. In case you forgot that this thing runs on ethanol. This new corn-powered wunderbike was unveiled on June 11, 2018, at a special viewing party with Teutel, RFA Vice President of Industry Relations Robert White, and an assortment of corn and renewable fuels people. Tech specs for the CornBike (trademark, original title, do not steal, etc. etc.) are pretty scarce, but we can make some observations from the pictures. It, uh, it sure is an American Chopper-style chopper. It has a big v-twin mill (probably an S and S unit), forward controls, open exhausts, pretty standard-looking suspension, tiny brakes—nothing too fancy or flashy or groundbreaking. It's pretty much everything you'd expect from a tryhard Harley-clone chopper made for a corporate lobbying firm. It pays to advertise, right? At least the decoration is eye-catching, if a bit corny (see what we did there?) The primary cover features the RFA's logo and doesn't look too bad, and the sheet metal is done in a glossy, metal flake, red white and blue motif with stylized E85 fuel pump nozzles. 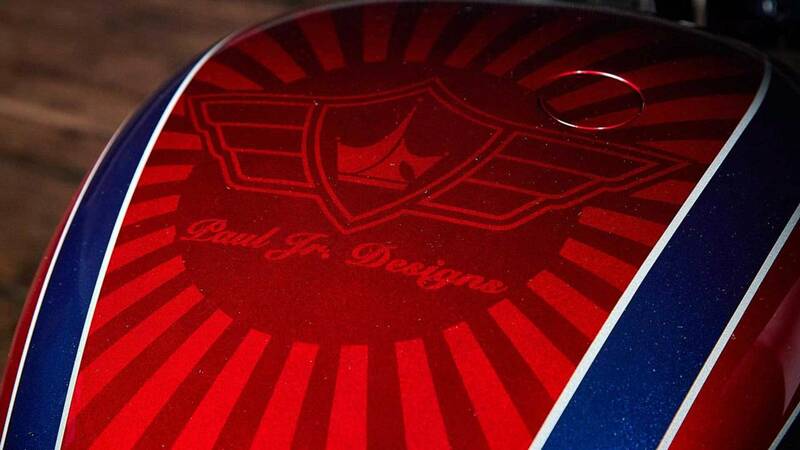 The horn cover on the bike's left side is a custom shield that reads "Ethanol Fueled With Pride", a design that's repeated over and over again on the rear fender, in the tooled-leather seat, pretty much anywhere Paulie could squeeze it in. 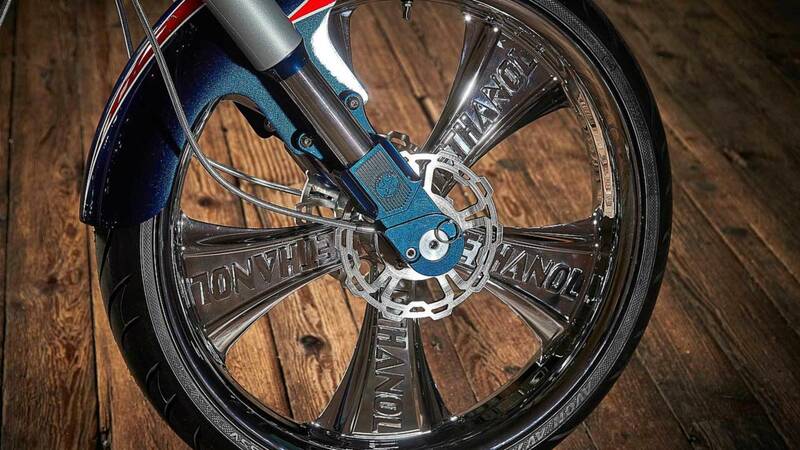 If you went and forgot that this thing runs on ethanol, the bike features custom five-spoke billet-looking wheels with ETHANOL stamped into each spoke. Subtle. So, how hard was it to get the v-twin to sip corn rather than dinosaurs? Not too hard, according to Paul Jr. 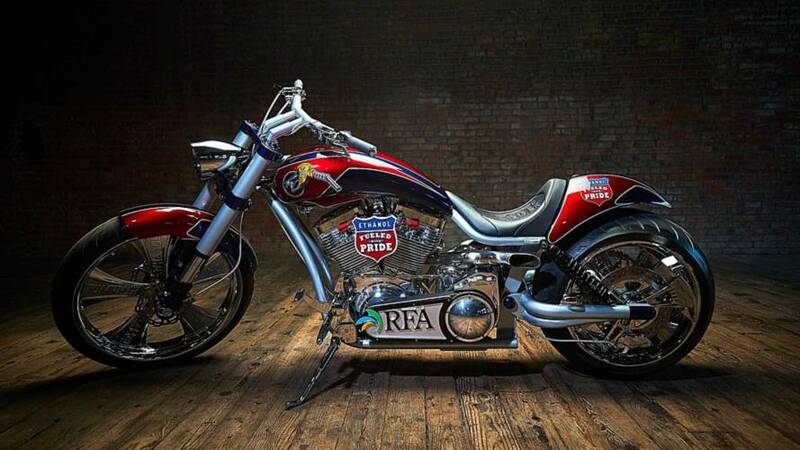 The bike is slated to be the centerpiece of the RFA's Fuel Your Knowledge campaign which was designed to educate consumers on the benefits of using ethanol blended fuels in their powersports toys. So, you know, keep your eyes peeled for the CornBike wherever you buy your corn.